Multi-media installation - 500GB Solid state hard drive. A trove of videos generated by exploiting micro targeting algorithms on YouTube. A realtime surround soundscape driven by the hyperactivity of the foreign exchange market. The Speculative Consortium for Refreshingly Updated Methodologies (The SCRUM) was a proposed project incubator, physical co-working space and idea disseminator pitched to Ravenrow gallery. Exploiting a network of art and research practices, SCRUM will produce contemporary art which uses critique to come to grips with the current global situation and speculatively re-route prevailing cultural vectors. Practically, SCRUM co-opts the organizational structures of think-tanks and start-ups, fosters a hyper-aggregative and permutable modus drawn from quantum thinking, and appropriates agile workflow methodologies from software development teams. A custom made Google Map mapping the location of every Mauritian address listed in the ICIJ Paradise papers trove. Credit Janis Lejins / International Consortium of Investigative Journalists. In_Visible Havens is an ongoing research project which seeks to grasp, and ultimately reroute and repurpose, the highly opaque world of 'offshore' finance. The 3STATE Collective (Janis Lejins, Jorge Simelio-Jurado, Mati Jhurry et al) exists in order to conduct ongoing in-depth investigations into the mechanics of offshore tax havens and the international movement of capital especially in relation culture. The intention of this artistic research is not to decry multilateral buisness practices or lament the disenfranchisement of the masses - instead the project seeks to grasp the complex material, philosophical and economic forces at play and repurpose them to speculatively propose and ultimately establish new models of financial, cultural and social relation to generate a reinvigorated, and more equitable, social good. In_Visible Havens has been generously supported by The Villiers David Trust and The Royal College of Art. “Somewhere Richard Nixon is smiling down from heaven” - Info Wars, 06/12/17. An online platform featuring an evolving performative artistic investigation. The project resulted in the production of 13 bespoke and ephemeral webpages which incorporated thousands of computationally accessed data streams. An ongoing series of video works exhibited at Arthill Gallery, & FACT Liverpool. Everyday the artist works a purpose made drawing machine draws the front cover of the Sun Newspaper for that day. Each drawing takes the full working day to produce, consumes one pen, and is composed by one contiguous line. By the time the machine finishes the drawing the day has endedand the artist goes home. Everyday a new drawing must be commenced. Every work is a unique edition of one. Over 200 Drawings have been produced and archived thus far. 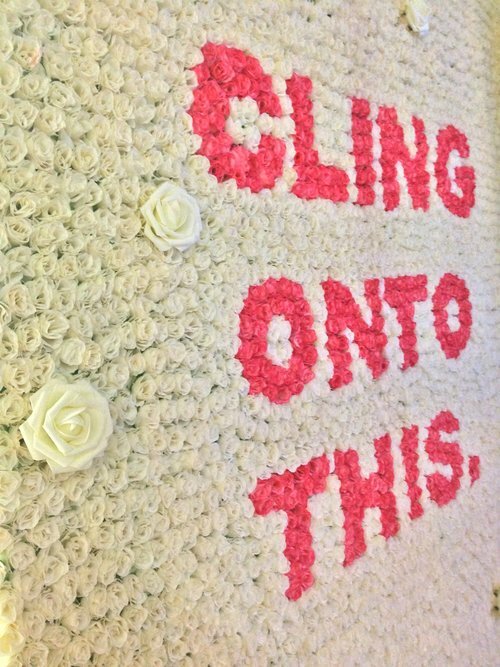 CLING ONTO THIS - APPROX 3000 FAUX WHITE ROSES, 12 LARGE FAUX WHITE ROSES, APPROX 100 FAUX RED ROSES, 244CM X 122CM.